Jon Huntsman: "We all win when we work together!" The Ambassador of the United States to Russia Jon Huntsman visited Kazan. Today, the Ambassador had a meeting with Tatarstan President Rustam Minnikhanov in Kazan Kremlin. The parties discussed the issues of cooperation in the frames of existing relations between Russia and the United States of America. 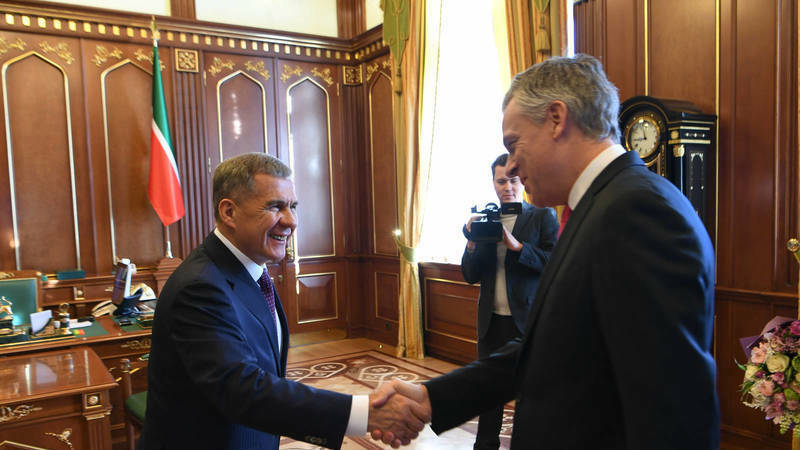 Rustam Minnikhanov told the Ambassador about the social and economic development of the region, identified a number of investment projects implemented on the territory of the republic with the participation of American companies. During the visit, Jon Huntsman visited Kazan CHP-3, where he inspected new unit equipped with gas turbine unit based on one of the most powerful and effective turbines in the world 9HA.01 produced by the American company General Electric, and also hat a meeting with the students of KFU. The visits to SEZ "Innopolis" and Island-town Sviyazhsk are also in the program of the visit. "What a reception! Glad to come to Kazan for the first time! I look forward to the opportunity to see how the Russians and the Americans are working together and succeed! General Electric and "TAIF NK Petrol Station" are the examples of the drivers of economic development and prosperity of both Kazan and the United Stated. We all win when we work together! ", - Mr. Huntsman noted after visiting Kazan CHP. It should be reminded that the US is one of the most active economic partners of Tatarstan. The republic employed such American enterprises as 3M, Ford, Allied Mineral Products; joint enterprise of "KAMAZ" and Federal Mogul Corporation for the production of cylinder-piston group parts in Naberezhnye Chelny; the project of "Delrus" JSC on creation of Interregional Center of Nuclear Medicine under Tatarstan Regional Clinical Cancer Center with the use of equipment of American company "Accuray" started its work. "Today was a wonderful day of my first visit to Kazan and I'm glad to see that the long tradition of direct contacts between the peoples of the United States and Russia is still strong. I am glad to see for myself the way active citizens and business projects contribute to the strengthening of ties between our peoples. I learned a lot about the history of Kazan, which just like the history of the United States confirms the important truth: when we work together in a spirit of tolerance and commitment to the common objectives, our originality".